The modern day restaurant can be traced back to the 18th Century and the French Revolution. Displaced chefs from aristocratic households set the precedent of private dining, a la carte menus, and gourmet food, marking the rise of fine dining. The 19th Century brought huge changes in travel, connecting cities by railway, increasing tourism travel, helping establish luxury dining destinations in Europe and abroad. The 20th Century has seen restaurants evolve into the familiar brands we see today, marking the rise of fast food, chains, and franchises, as well as a return to organic, local foods. Through it all, the original fine dining concept continues to define the best of the restaurant industry. The term restaurant itself is French, once used to describe the rich bouillons served at taverns and public houses to restore the spirits and relieve ailments. Following the French Revolution at the end of the 18th Century, unemployed chefs from aristocratic households began opening their own restaurants. They added touches of the upper class to their establishments. Guests did not have to take their meals at a common table, as was typical of taverns and roadside inns. Instead, they had private tables, held by reservations- a new concept. They dined with fine china and cutlery, and tablecloths- all trademarks of modern day fine dining. Menus, either prix fixe or a la carte were framed and at the end of the meal, guests were presented with a check, tallying the amount of their bill. Many fortunes were made for these professional chefs-turned-restaurateurs. They catered to a new class of provincial deputes that came to Paris following the end of the Revolution. Savvier restaurateurs adapted their eateries to include such amenities as bathrooms- for which there was a charge to use. Before the Revolution, there were less than 50 restaurants in Paris. By 1814 3,000 restaurants were listed in the Almanach des Gourmands- a popular travel guide. During the 19th Century, the number of restaurants in Paris continued to rise. After the defeat of Napoléon, wealthy Europeans flocked Paris to partake in the many gourmet dining options. This was especially true of the allied officer gentlemen- a move that would be repeated following the end of WWII. The 19th Century also marked the rise of Cafes, a style of restaurant which does not offer table service. Rather, customers order their food from a counter and serve themselves. Outside of Paris soup kitchens and dairy shops offered home-style cooking for cheap, attracting members of the lower working class. By the end of the 19th Century, advancement in transportation through steamers, railways and eventually automobiles brought about a change in travel. Luxury tourism grew and with it a new precedent of eating well away from home. No longer was eating while traveling a mere necessity. It became an art. 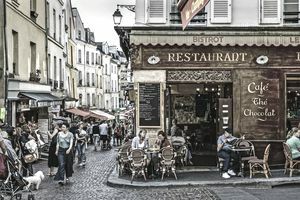 Part of the travel experience was dining at famous Parisian cafes and restaurants, who by now had built a solid reputation for excellent food and service. In the 1820s, Cesar Ritz, a Swiss developer, partnered with a prominent French chef, Auguste Escoffier and built the Grand hotel of Monte Carlo, the first to offer luxury accommodations and gourmet dining all under one roof. Other luxury hotels soon began popping up all over Europe. The 20th Century saw the French Restaurant go global. In Spain it was a restaurant. In Italy it was called a ristorante. In Great Britain and the United States it remained restaurant, but would soon evolve to fit the demands of changing consumers. By the end of that century, restaurants in the United States would evolve further, introducing the world to restaurant chains, the rise of modern-day fast food and an eventual return to the farm-to-table movement.